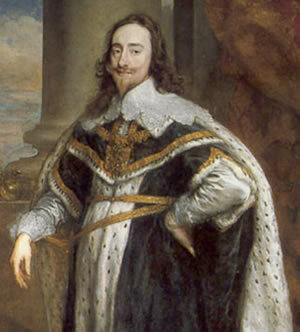 The English Civil War started in 1642 when Charles I (pictured) raised his royal standard in Nottingham. England was split between those that supported the King and those that supported Parliament. In the case of Burton, support was fairly strongly parliamentarian. One of the most prominent Burton paliamentarian was Daniel Watson of Nether Hall. Before the outbreak of the civil war, he was a lawyer but he became a captain of dragoons in the Derbyshire cavalry. Burton’s allegiance was largely a result of its puritan following. There was some unrest in the town at the outset of the war with rumours of gunpowder being hoarded to support rebellion. Although investigations by Lord Paget concluded that this was unfounded, in 1643, there was a large explosion in Saint Modwen’s church in the Market Place which destroyed the roof and blew out the windows. With its highly strategic river crossing that was noted at the time as “the chief passage from South to the North”, and situated between parliamentary Stafford and Derby and royalist Lichfield, Tutbury, and Ashby-de-la-Zouch, Burton was destined to be fought over throughout the civil war and lacking walls or natural defences, it changed hands many times. Burton was the rendezvous for the royalist forces of the Earl of Chesterfield and his son Ferdinando Stanhope late in 1642, but the establishment of a parliamentarian garrison at Derby brought Burton to the attention of the conservative parliamentarian Sir John Gell and the rest of the Derbyshire county committee. 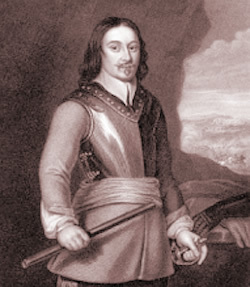 In February 1643 Gell placed an artillery company in Burton under Major Johannes Molanus, a Dutchman who had actually come to England to assist with drainage projects in Lincolnshire. The garrison withdrew later the same month with orders to support an attack on the royalist stronghold of Newark in Nottinghamshire. After capturing Lichfield for the king at the end of April 1643, Prince Rupert also placed a garrison at Burton, but it was promptly driven out by the forces of Gell and Lord Grey of Groby, commander-in-chief of the East Midlands Association. They installed Captain Thomas Sanders with a garrison of 200 foot, 60 dragoons, and one cannon drawn from the forces of Derbyshire. Sanders quickly deserted Gell’s command and placed himself and his troops under another parliamentarian officer, Col. Richard Houghton, and the Staffordshire county committee. Sanders was more radical than Gell, and may have feared that his appointment with only a small force in poorly defended Burton was Gell’s way of removing a potential rival. On 4th July, 1643, that garrison was stormed in what was probably the most famous local battle of the war – ‘The Battle of the Bridge’. An army under Queen Henrietta Maria, wife of Charles I, was commanded by Thomas Tyldesley (pictured), a supporter of Charles I and a Royalist commander from Lancashire, at the time having the rank of Colonel, led a cavalry charge across the bridge to attack Burton. It was a very bloody confrontation in which the church was damaged and the town was, according to Gell, “most miserably plundered and destroyed”. At the end of the battle, so much booty was taken that the Queen, who witnessed the battle, recorded that her soldiers “could not well march with their swollen bundles”. After the battle, Burton became an important Roundhead stronghold and, largely because of the success of this attack against the odds, Thomas Tyldesley was knighted. A plaque to commemorate the event was erected on the replacement (current) bridge by the Burton Civic Society in 1993. It is still there today but goes largely unnoticed. The royalists remained in control for the next six months and fortified the bridge, but were again driven out by Gell’s troops in January 1644. No garrison appears to have been established, and Burton was soon again under royalist control, although it was attacked and ‘plundered’ in a parliamentarian raid in April 1644. The King’s forces from Lichfield were quartered in the town in July 1644 but they were driven out by Gell’s troops. A fresh parliamentary garrison of both Derbyshire and Staffordshire troops was installed in the town in November 1644, but by February 1645 Burton was once more under royalist control, and it was there that Charles I made his headquarters briefly at the end of May 1645. It was firmly and finally under parliamentarian control by early 1646, when the town contributed both money and beer to the parliamentarian forces besieging Tutbury and Lichfield. A later list made in 1662 recorded that 127 former Burton parliamentarians. This was the largest count in Staffordshire with the esception of Stafford. After the Restoration, Burton was a dissenting centre, with large Presbyterian and Baptist conventicles meeting there with five excluded ministers. This raised some doubt with Anglicans over the loyalty of the town’s population. Nonconformity remained strong in the town until the early 18th century. Within ten years of the passing of the Toleration Act in 1689, six houses were registered for dissenters and there were Presbyterian, Baptist and Quaker meetings in Burton. 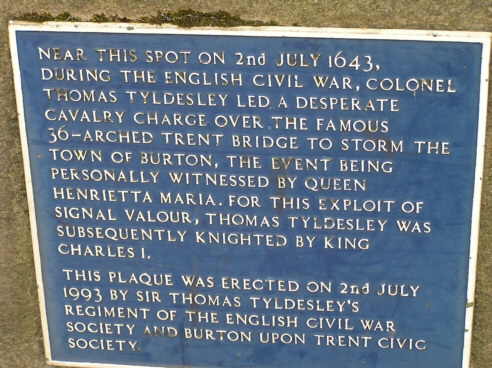 A plaque to commemorate the event, erected by Burton Civic Society in conjunction with Sir Thomas Tyldesley’s regiment of the English Civil War Society, can be found on the current Trent Bridge. NEAR THIS SPOT ON 2nd JULY 1643, DURING THE ENGLISH CIVIL WAR, COLONEL THOMAS TYLDESLEY LED A DESPERATE CAVALRY CHARGE OVER THE FAMOUS 36-ARCHED TRENT BRIDGE TO STORM THE TOWN OF BURTON, THE EVENT BEING PERSONALLY WITNESSED BY QUEEN MARIA [wife of Charles I]. FOR THIS EXPLOIT OF SIGNAL VALOUR, THOMAS TYLDESLEY WAS SUBSEQUENTLY KNIGHTED BY KING CHARLES I. THIS PLAQUE WAS ERECTED ON 2nd JULY 1993 BY SIR THOMAS TYLDESLEY’S REGIMENT OF THE ENGLISH CIVIL WAR SOCIETY AND BURTON UPON TRENT CIVIC SOCIETY.